I was meant to write this post in February, but now we are in March. These photos were taken in February so the kids are a month older in reality. 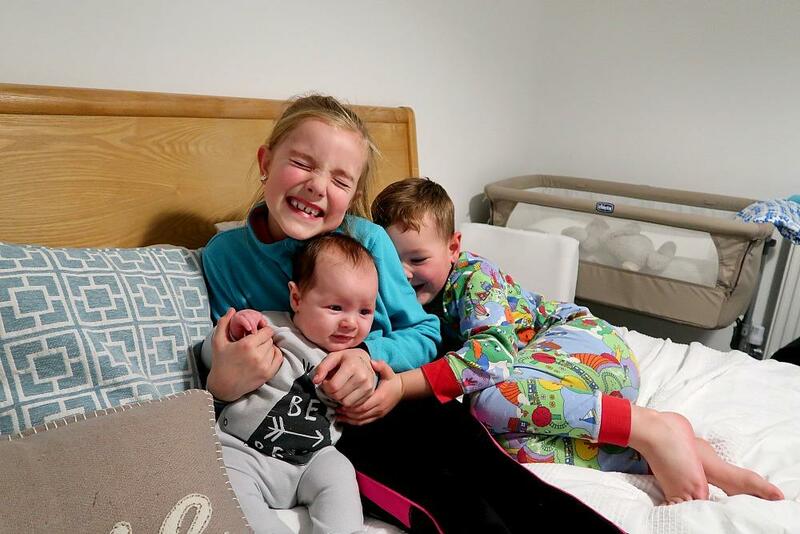 I really want to join in with My siblings Linky this year and watch my three grow up over the course of this year together. Here I am with my first siblings post of 2018. This year has started off so lovely with out new addition Arthur. We all just adore him he is such a calm and relaxed little boy he has such a lovely effect on our whole family dynamic, I am just so happy in our little family bubble its grown and I love how full my house feels. Daniel and I were chatting (as we always do) about how lovely it is this third time round. We know Arthur may possibly, most probably be our last baby. So we are both just as determined as the other to savour every single moment of his sweet face and baby stage. We also can’t believe how quickly it is going. We stare longer, we hold him for longer, we appreciate every moment there just doesn’t seem to be any tough days at all ( I dont know if having a third makes you completely immune to them?). I don’t know if it is because we are much older (28 and 30), being 21 and 23 when we had Sophia and then Archie was equally as special as Arthur, but more of a lets get through this sleepless newborn stage then a please, please don’t grow up … at all stage! We became parents for the third time round knowing of the sleepless nights the hard times and the challenges we were supposed to be met with, but our expectations have not been met at all. Arthur has been our easiest baby by far and has been our third time lucky baby from the moment we conceived him. He really has. I have said it to a few of my friends but number 3 is my lucky number and here I am with my lucky third baby proving all my beliefs about babies and sleepless nights wrong. He is just a little dream and we are just so lucky and grateful to have him here with us, all of us are, Sophia and Archie absolutely adore him as do his mummy and daddy. But I plan to talk more about how I’ve managed such a good sleeping routine with him in another post. I really do want to share with you some of the what I have done and haven’t done this time around as he has been sleeping through mostly every night since he was born. My three. Every single day I will have a moment of realisation that I have three kids, yup, three, T.H.R.E.E. It takes some getting used to. Now when I walk down the road, do the school runs go into town I no longer have each child on each hand but both hands on a pushchair and the older two holding the pushchair. Its a completely different dynamic for me. But I love it. 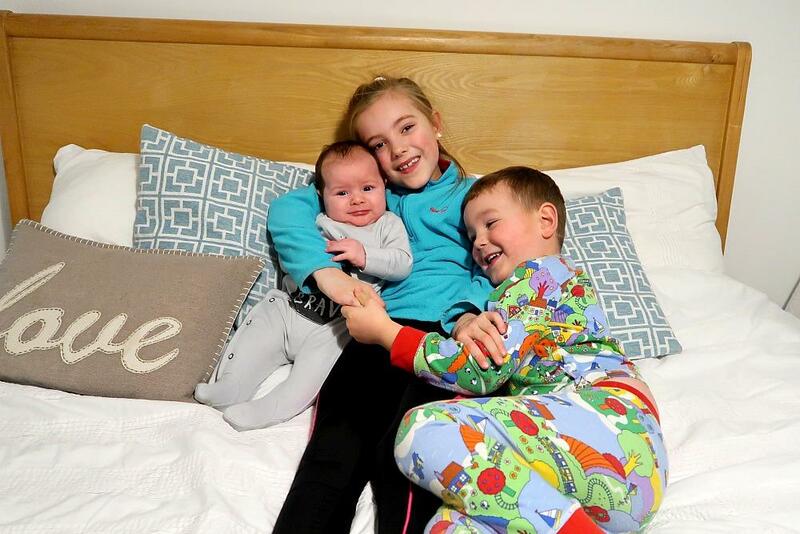 I have loved absolutely everything about becoming a mummy of three. It has been one of the most amazing times of my life. I feel so good, Im so happy and my family it just keeps getting bigger and I love it. I love how we are now a five and I feel like it is just perfect. Im reminded everyday looking at my 7 year old Sophia and then to my 3 month old Arthur just how quickly it goes, almost slipping through my hands, Arthur is my last desperate attempt to grab it and keep it from going any faster. So March. Well, how is it that we are nearly at the end of you. It has been a lovely month for us with lots of plans and lots of saving and generally spending less on material things we just don’t need. Yes we could upgrade our sofa and our car, but there really is nothing wrong with either and we are focused on doing a few life changing things this year so we are going to be saving as much as we can. We would really love to go on a family holiday this year as last year we didn’t go abroad as a family and did so separately. Daniel for a stag do and I tagged along with my mum and sister’s to Cyprus with Sophia and Archie. It was lovely but we really missed Daniel. I really would love to take him to Cyprus this year. I always seem to go off on a tangent with my thoughts when I write, so siblings… When Arthur first made his appearance it was a huge adjustment for both Sophia and Archie. There were moments I was a bit overwhelmed but Daniel always stepped in and lovingly looked after the older two so I could have those first special bonding moments with Arthur which I craved. I think every new mum does even more so if it is your second or third baby. Time seems a little more precious. So we had moments of crying over who was to hold him first, moments of sadness from Archie that I loved Arthur more which broke my heart. But these moments were short lived and after a couple of weeks things were a lot more settled. 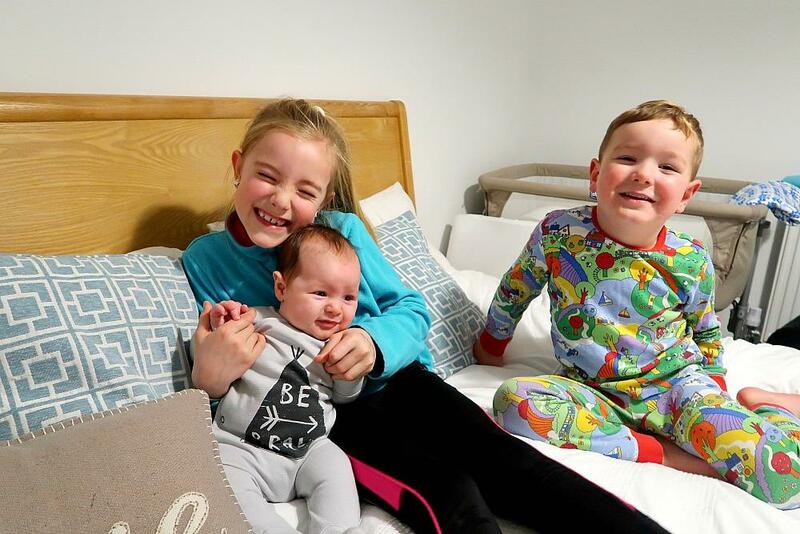 But I can honestly say the hardest part of becoming a family of five and introducing Arthur was not the juggle, not the cluster feeds and broken sleep, but the worry of how my older two would deal with having a third sibling mostly Archie as he was my baby. Everyone has always commented on our bond. It has always been so strong. I do put it down to the day of his birth and the realisation that we could have lost him, but we didn’t. Its just inbuilt in me this utter protection for him. His clumsy nature, although he is strong and doesn’t really complain of anything even if he grazes his knee, I have always had this overwhelming feeling to protect him. I remember when I was pregnant with him, I just knew there was something not quite right his movements had changed and I kept going in to hospital with worries. I got hypertension, I was worried sick. Low and behold when they broke my waters his cord nearly strangled him to death. I don’t know what would have happened if I hadn’t pushed him out in four minutes. Every single day I thank my lucky stars he made it and he is here safe with me. It brings tears to my eyes remembering that day. I am both sad and happy thinking about it. Sad for what he went through, his little body, his heart starved of the oxygen it needed, but happy, happy that he made it. I will never forget the realisation hours after birth when I really realised what he went through. Over the hours and days after his birth his eyes filled with blood it was like looking into a bloody river. There was no white just red and black. There is so much more that I remember but those were the most poignant parts in my memory and for that experience with him for that I have always tried harder with him, to protect him, to love him, to be patient with him, and so for all those reasons and more I worried about him the most and how me been whisked away into the blurry newborn haze and what it would do to him. 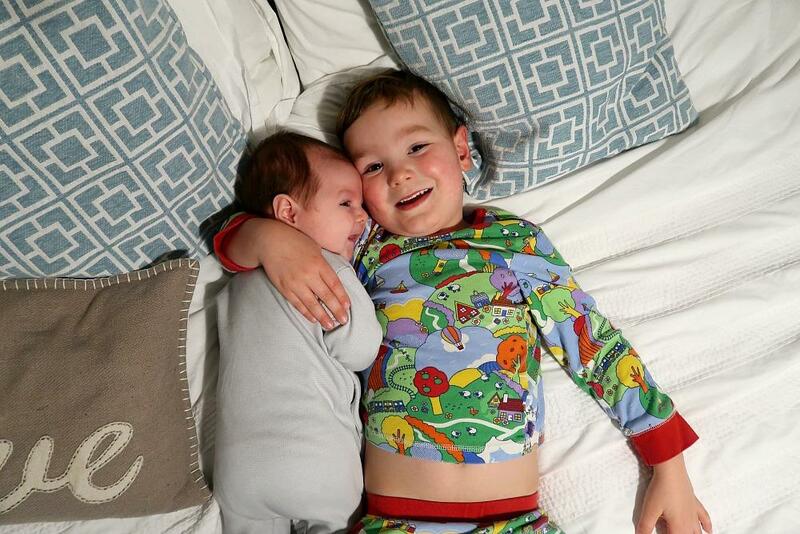 But I really had nothing to worry about at all because he is the most loving most kind and most caring big brother I could have ever wished for for Arthur. It brings me the biggest smile to think about how loved Arthur is by Sophia and Archie he is just the luckiest little boy. (I hope you will always know that Arthur). I hope he will always know just how much he is adored by them. Everyday they tell me just how cute he is. Sophia I had no worries for her to become a big sister only that maybe she’d miss me a little and only anticipation to see her mother her baby brother and adore him just like she did Archie. She is the most loving daughter I could have asked for. She is so soft and gentle with Arthur, truly maternal in every single way, I trust Sophia with my life. I couldn’t actually articulate just how much she loves him. I think you’d really have to see it for yourself. Its in the way she holds and strokes his little hand while he sits on her lap after school watching her favourite TV programme. Its in the way she kisses him all over his little face when she changes his nappy. Its in the way she laughs at him when he looks at her and smiles. She giggles so softly and looks at me with those beautiful hazel eyes of hers and they are almost creased up with adoration as she tells me how cute he is and how much she loves him. Arthurs little smile really does light up all of our hearts so I can only agree with her for her special words about him. So I really had nothing to worry about with my older two and they really have taken to their new roles wholeheartedly and passionately. I couldn’t have asked for more from them. The sibling bond is only at its roots just yet and its slowly starting to take shape. I cant wait to watch them all grow up together. Three of my biggest loves in my life, they all equally bring me so much joy in my heart and into my life. I’m so proud of my three. I think I also owe it to Daniel my dear husband for these three special humans he blessed me with. 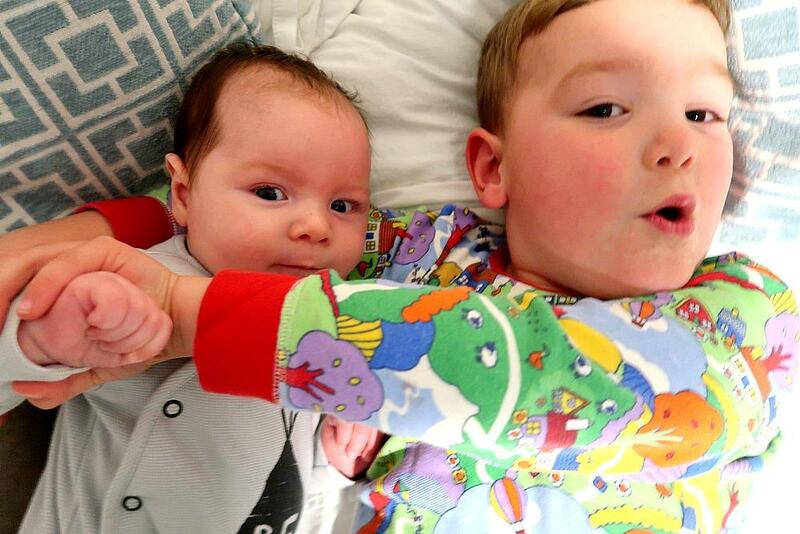 Ahh this is gorgeous, your children are absolutely adorable! There are ten years between my first and my fifth baby and I love seeing the bond they share.